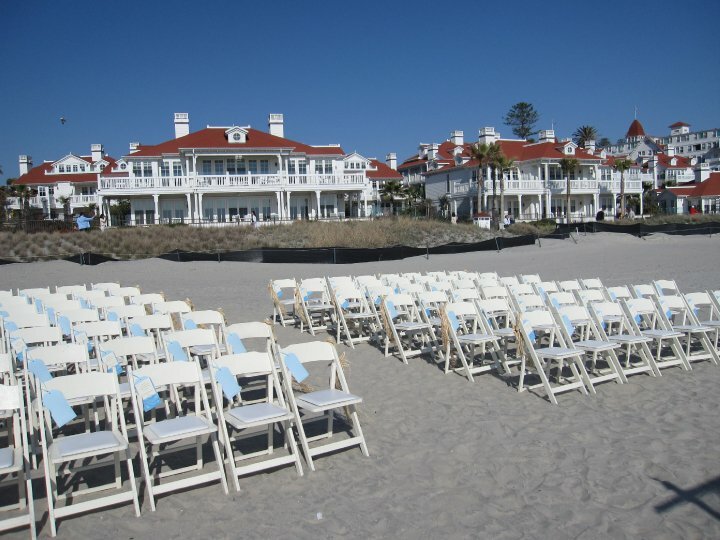 First up, the chairs arrayed on the beach in readiness, the Hotel del Coronado in the background. Next, the entrance of the parents of the groom. This wedding procedure was a bit different from those I am familiar with. First the groomsmen entered from the walkway back by the hotel and took up position near the archway/altar, whose shadow shows in the lower right corner of the above picture. Then the mother of the bride entered with her husband and son on either side. Next, Adam and Stu escorted me on either side. 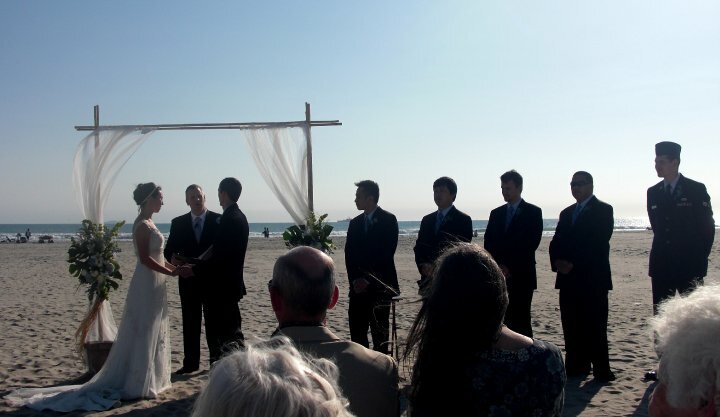 Lastly, again from AnnMarie’s cell phone, a picture of the ceremony itself, the arch, the groomsmen, the ocean in the background. That’s Stu and I in the front row. Beautiful view! 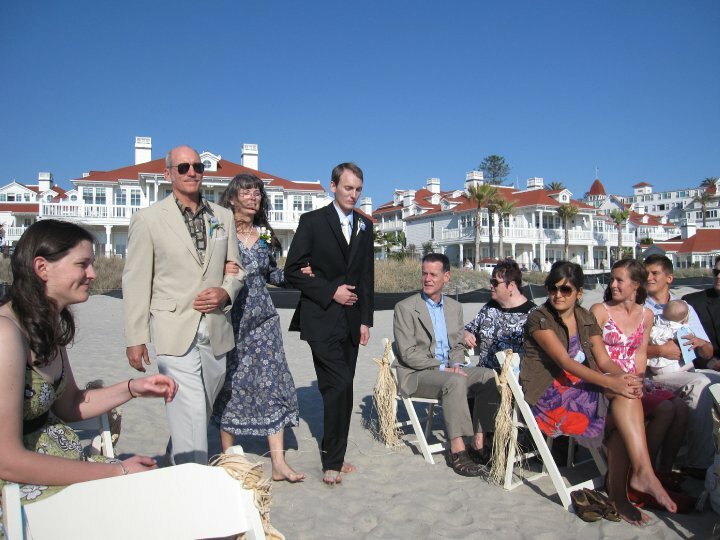 This entry was posted in Life, Photos and tagged beach wedding, Life on March 21, 2010 by Karen Hancock. Wow. That is so sweet. May God bless your son and his wife’s lives together. As I view the photograph, and think of how many times my wife and I went to this beach over the years, and as a young man growing up as well, it brings about many fond memories. I am not sure if you noticed something peculiar about the sand — it really slips passed most of the folks that enjoy this wonderful beach and I can surely understand why, what with all of the more obvious things to entertain the eyes and all, but if by chance you can remember shaking it off from your feet and lamenting its ability to remain, perhaps a little sparkle caught your eye? I can remember shaking off my own feet many times and quietly cursing it for years until my wife pointed out something that I’d been missing for . . .well, for more than forty years now. It was there all along you know, beautiful to the trained eye and I suppose that is why it took a woman to point it out (at least that my story and I’m sticking to it . . .dam-it) and really quite remarkable now that I have an “eye to see”. There in the sand, and more so than any other beach that I have been to in the more than 40 years that I have lived in San Diego, and this includes many of the beaches in Mexico as well, there is gold. My science friends say that it is Micah, but just you try to tell this to my wife, she’d sock you in the nose . . .Ha . . .Ha . . and tell you that “it’s gold” and that’s what I love about her, never one to shirk a task. See ya kid-0 . . . Thanks for all the comments, William. I did notice the way the sand stuck. Since we took Quigley to the dog beach, getting sand off was an issue. I also noticed the little black flecks and the way sometimes with patches of undisturbed sand the surface would look glimmery-black, with the white underneath. I’d not thought of mica. But then, while we have a lot of that here in Tucson — we call it fools gold — it’s not the black kind, but the more translucent, goldish kind. But thanks for reminding me of that. And I’ll look for it more intently next time we go. Hey Karen – my first novel, Wayback, deals with the six day war and covers the major players (on both sides) and the major fronts in the war.